Everyone should know the benefits of and use sunscreen when headed outside. But what if you find sunscreen stains on your clothing? Sunscreen tends to create dark brown stains on fabrics if not removed immediately. Learn what causes the stains and how to get them out. For most people, the worst stain caused by sunscreen on fabrics is a slightly oily stain which can be easily removed. Even this stain can be prevented by allowing sunscreen to dry completely before you dress and by avoiding clothing when reapplying. However, for anyone who has to do laundry in hard water, most sunscreens contain products that react with hard water to create dark brown stains which are much more difficult to remove. The culprit ingredient is avobenzone. When avobenzone mixes with minerals found in hard water, it can lead to brown, rust-like stains. The severity of the problem depends on the fiber content of your garment (synthetics stain more easily than cotton or natural fibers) and the hardness level of your water. If your well or water system is high in mineral content, read the ingredient levels in sunscreen and avoid those with avobenzone. 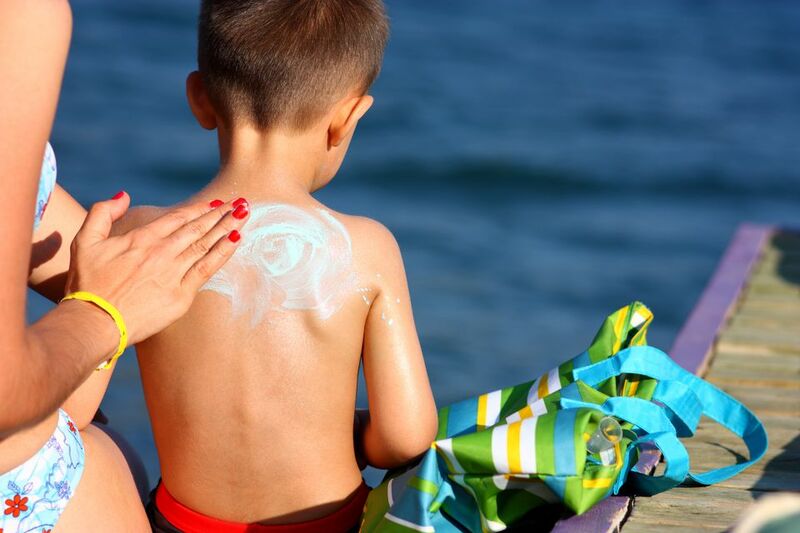 Here's a tip if you are in a rush and can't treat sunscreen stains right away—remove any globs of lotion with a spoon or dull edge and sprinkle the stain with talcum powder or cornstarch. Or, if you're at the beach, use the sand! Let the powder or sand sit on the stain for at least fifteen minutes before you brush it away. This will help absorb the oil until you can wash the garment properly. To properly remove the stain if the mineral content in water is not an issue, pretreat the sunscreen stain with a with a prewash stain remover or a bit of heavy duty liquid detergent. Tide or Persil are rated as the best brands with enough enzymes to break apart the oily component of the stain. Work the stain remover into the sunscreen stain with your fingers or a soft bristled brush and let it work on the stain for at least fifteen minutes. Wash as usual in the hottest water recommended on the garment care label. Check the stained area before tossing the item in the dryer. High heat can set the stain and make it much more difficult to remove. If the stain remains, repeat the stain removal steps. If your water has a high mineral content, use a water softener or distilled water to wash the sunscreen stained item. Be sure to both wash and rinse clothing in warm water treated with a water softener. Avoid excessively hot water temperatures and chlorine bleach if you have hard water. These can make the problems worse. If the stain is still present, launder with a commercial rust remover. Commercial rust removers are for use only on white or colorfast fabrics. If the garment is labeled as dry clean only, it is best to head straight to the cleaner. Point out and identify the stain to your professional cleaner. If you are applying sunscreen and a blob falls on the carpet, act promptly. Use a dull knife or spoon to lift the sunscreen away from the fibers. Do not use a cloth to wipe or rub away the lotion because that will only push it deeper into the carpet fibers. Mix a solution of one teaspoon liquid dishwashing detergent with one cup warm water. Again, if you have hard water and do not use a water softener, use bottled distilled water. Dip a white cloth or soft-bristled brush in the cleaning solution and blot the stain. Use a dry white cloth to blot away the sunscreen and cleaning solution. Take the time to rinse the area with a clean cloth dipped in plain water. If you do not rinse, the soap residue can actually attract more soil. Allow the carpet to air dry away from direct heat or sunlight and then vacuum to lift carpet fibers. If the stain was not treated promptly and has turned brown, you can use one tablespoon of hydrogen peroxide mixed with two tablespoons of water to treat the discoloration. Use a cotton swab or eye dropper to apply the solution. Blot with a clean white cloth and keep moving to a clean area as more of the stain is transferred. Do not use this method on dark carpets because it can cause fading. The same cleaning solutions and methods recommended for carpet can be used for upholstery. Be sure to avoid over-wetting the fabric because it can cause mildew problems in the cushions. Consult a professional upholstery cleaner if the upholstery is silk or vintage fabrics or if you need more stain removal tips.